I love quintessentially British brands, and Woods of Windsor, which originates from an 18th Century apothecary, is definitely on my list of favourites. I love their classic scents such as Lavender and Lily of the Valley – the soaps in particular! But recently they have introduced a new fragrance to their collection called Blue Orchid & Water Lily, which I wanted to check out. I tried their premium quality Eau de Toilette, which uses pure, natural oils and is presented in a beautifully elegant classic glass bottle. The scent is ideal for Spring-time as it’s floral and feminine but it has a fruity depth to it – given to it by a hint of exotic mango – adding a twist to the fragrance. It’s very modern and could be easily confused by a high end perfume as it combines fresh floral notes with juicy fruit ones. It’s light enough to stay throughout the day without being too strong and ideal for every-day wear and day to evening. 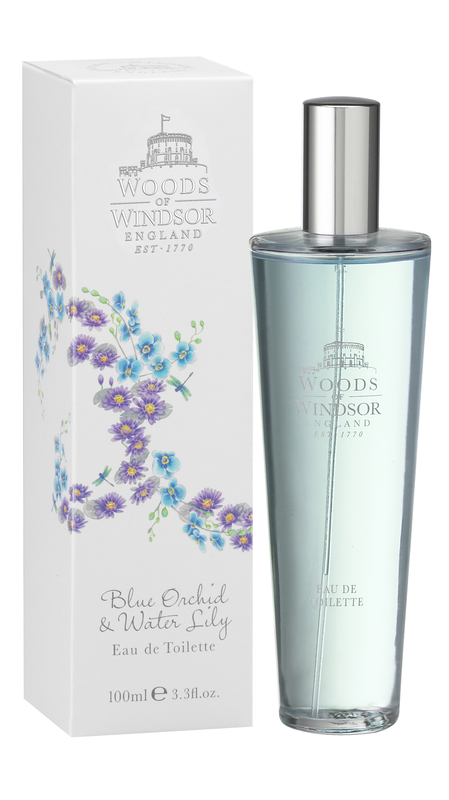 The Woods of Windsor Blue Orchid and Water Lily Eau de Toilette 100ml is priced at £14.99. For more information go to www.woodsofwindsor.co.uk. This entry was posted in Scents and tagged Blue orchid and Water Lily, EDT, fragrance, fresh, perfume, Spring, Woods of Windsor. Bookmark the permalink.